The Garden Kingdom of Dessau-Wörlitz is a series of landscape parks developed in the 18th century by Prince Leopold III Friedrich Franz of Anhalt-Dessau and his friend and adviser Friedrich Wilhelm von Erdmannsdorff. Inspired by trips abroad (Italy, England) they were the first to introduce landscape gardening to continental Europe. They also applied the philosophical principles of the Age of Enlightenment to their landscape design: the result should not only be pretty to the eye, but also educative. 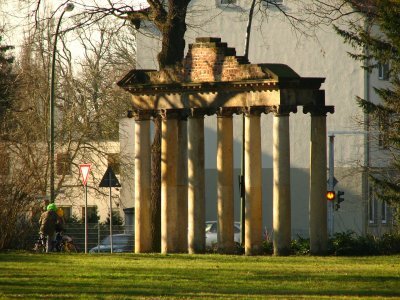 The worldheritage listed sites within the Garden Kingdom include the Kühnauer Park, the Georgium (in Dessau), the Luisium, Oranienbaum, Wörlitz Park and many small ornaments along the road. 'It is impractical to consider re-routing the Autobahn...', ICOMOS stated in its evaluation of the Garden Kingdom's nomination. The modern roads were distracting too much from the original visual scenery. Maybe it's just me, or I just arrived from the wrong (west) side, but there's a whole lot more that spoils the views here. Dessau in particular is a very urban and industrial area. I choose the Georgium for a more up and close visit. It's the second biggest park after Wörlitz. As a result of ongoing urbanization it in fact has become a kind of city park. Most of my fellow visitors this Sunday morning were either walking their dogs or working on their (own) physical condition. The Georgium is quite representative for the Garden Kingdom as a whole: it has a small palace, a lot of neoclassical buildings and an animal garden for educational purposes. Before commencing the long drive home, I turned into a small alley that still had the original views as the Prince of the Garden Kingdom probably meant it. I did it in similar way like others, and visited parts of the Garden Kingdom in Dessau adjacent to Bauhaus sites: I could see&visit Georgium when I was walking from main Bauhaus building to Masters` houses, but it was not very appealing for me, because the park, artifitial ruins and eclectic buildings are now penetrated by modern urban lanscapes and roads. I entered the WHS once again after visiting Masters`houses: I walked along Ebert-alle towards Weinbergschlosschen around 15 minutes. This neoclassicist bulding is quite small but pretty (see photo). Then I entered the natural park - in fact a blend of meadows, solitary trees, lakes, marchlands where everything was in bloom in May. This was my highlight of the WHS but I am not sure if it is related to OUV... Then I walked towards Elbe river and had a drink and light lunch in very pleasant Kornhaus Dessau - round functionalist restaurant. I visited this WHS in November 2014. This WHS is made up of a cultural landscape interconnecting historic houses and gardens on a large scale. I visited all the inscribed gardens in Worlitz, Oranienbaum, Dessau, Großkühnau and Mosigkau over 2 full days. Most of the buildings are best viewed from the outside as not much is left in their interior. When I visited it was quite chilly so I opted to walk along the several trails in different parks to take in the size of the garden kingdom and the colours of the Autumn landscape. In my opinion the inscribed sites in Dessau should only be visited as a little extra treat after visiting the Bauhaus building and the masters' houses. Urban sprawling and the Autobahn completely ruins any OUV there might have been in the past. The best overview and experience can be had at the Worlitzer Park. 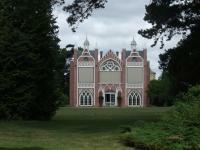 I enjoyed birdwatching there and the highlight of my visit was the restored Gothic House. 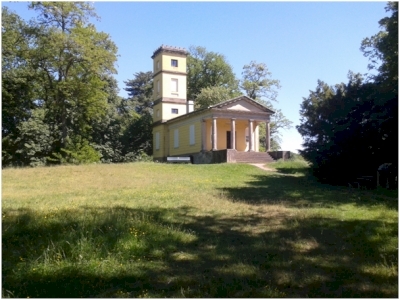 Shortly after I visited the gardens in Oranienbaum and Mosigkau. The Chinese buildings and the Luisium stand out from the rest of the buildings. I have mixed feelings about these garden WHS and I cannot say I can really grasp their true OUV. Although it makes an interesting visit, I don't think it's even comparable to the WHS in Potsdam/Berlin. 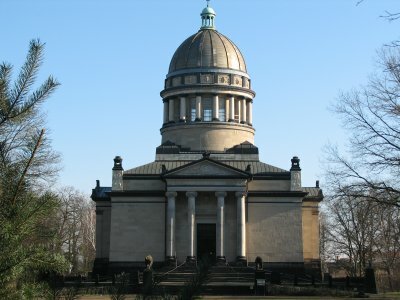 The Garden Kingdom of Dessau-Wörlitz covers an area of about 140 square kilometers and consists of several English landscape gardens. 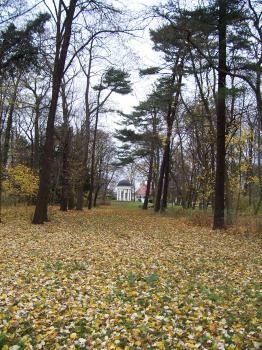 The largest and most beautiful park is in Wörlitz. We were in Dessau in the summer of 2009, and after we had visited the Bauhaus sites the day before, the Garden Kingdom was the next WHS on our list. It was a warm summer day, so we went by bicycle to the Wörlitz Park (about 20 km). Thereby, we came also through some of the other parks: Georgium and Luisium with smaller palaces and pavilions, and the Sieglitz woodland park. 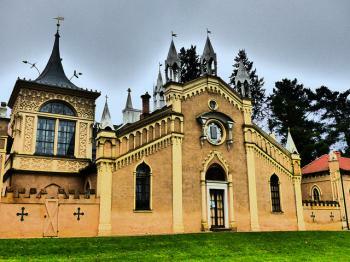 In Worlitz we visited the Palace, the Gothic House (photo) and the Villa Hamilton. All the parks are well maintained and preserved and we enjoyed our bike tour. However, I found the Garden Kingdom not outstanding. 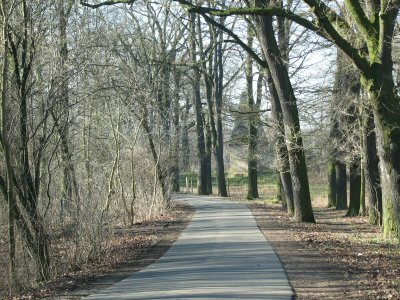 The parks in Berlin and Potsdam, which we had visited some days earlier, impressed me much more. But maybe I was biased because we had visited too many parks in just a few days and because in Dessau I was more focused on the Bauhaus sites. After the austere gardens of Muskauer Park the Worlitz gardens were at the other extreme with an abundance of ornamentation. I visited the pleasant Luisium, Georgium and Muskigau parks within Dessau city first then took the train, a single car double deck contraption, out to Worlitz. The garden there is attractively laid out, but is cluttered by many structures including a Roman villa, a synagogue, a church, wierd bridges and a stone grotto. But the chain ferries used to link the footpaths to the islands were a novel idea. The area south of Berlin contains 3 WHS inscribed parks/gardens – at Potsdam, at Bad Muskau (see my review) and at Worlitz (between Dessau and Wittenberg). Taken together, they no doubt provide an interesting “potted history” (!) of European garden thought and design in (mainly)the 18th century but I guess you are going to have to be pretty interested in “Gardens” to visit all 3! The latter in particular covers an enormous area – it is in fact a collection of gardens and palaces spread over some 25 kms (Hence the title “Garden Kingdom”) and requires real interest and dedication as well as lots of time to appreciate fully. It is however more than just a “garden” - It has been said that it “provides a visual lesson on the Age of Enlightenment …. The credit of Dessau's garden kingdom goes to Prince Leopold III Friedrich Franz von Anhalt Dessau, more an enlightened thinker than a gardener. In the 18th century, the prince was inspired by the progressive theories on nature and humanism, and by industrial and agricultural developments in England. He then converted his cerebral musings into a gorgeous garden. Using the principle of "usefulness and beauty" as his guide, he planted fruit trees for shade and produce, erected a flood watchtower inspired by the Pantheon, and laid down pleasant paths that link tiny villages, creating an enjoyable commute home". 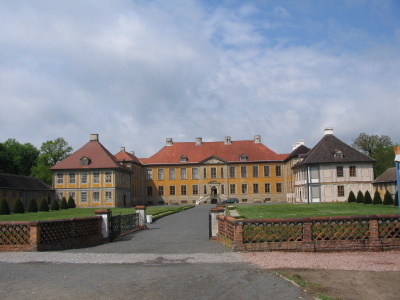 Luckily the previous night we had stayed in the nearby town of Oranienbaum – yet another part of “Garden Kingdom” but still included in the WHS, and had managed to see it under better weather conditions! Its design was put in place as early as 1683 by a member of that much travelled Dutch family Princess Henriette Catharina of Nassau-Orange and her architect, Cornelis Ryckwaert. Later it was incorporated by Prince Franz into his larger structure and he added an Anglo-Chinese Garden complete with Pagoda (photo). We only had a brief visit to the Georgium park in Dessau, which is just across the road from the Bauhaus Mastershouses. We had a brief walk through the park in the icy cold weather, and popped into the Georgium itself (now the Gemäldegalerie) to look at the gift shop, mostly just to warm up though. 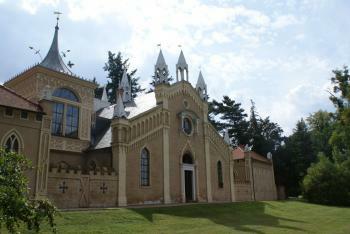 We also strolled up to the Mausoleum whose grounds are now being used as a small zoo. It was a pleasant walk and the carpet of leaves on the floor was nice. It was also enjoyable catching glimpses of some small folly; faux Roman remains or a temple, in the middle distance. On the whole though it didn’t feel like a remarkable place to visit. The whole Dessau-Wörlitzer Gartenreich is a large area and probably really worth exploring however there are no public transport links in winter so we didn’t get chance to give the site the time it needed. However having a World Heritage site on the opposite side of the road from another was always going to make the walk back to the train station in Dessau more enjoyable. I have a very esoteric criteria for knowing when I have visited a site or not, I mostly go on my intent and whether I have knowingly ventured into its boundaries, and I feel that I can count this one as a visit although we certainly didn’t do the site justice, but unless we were back visiting the Bauhaus again in summer I don’t think I will be exploring much further. Viewable from another WHS: From the Meisterhäuser (Bauhaus) You can see the Georgium (part of the Garden Kingdom).